March 3, 2011 - Tulare County is situated about a hundred miles north of Los Angeles near California's Sequoia National Forest. Facing the same budget constraints as many localities, Tulare County Sheriff Department Captain David Williams chose a Light-Sport Aircraft to perform patrol duties. He ordered a Flight Design CTLS. According to David Castellon writing for the Visalia Times-Delta newspaper, Tulare County Sheriff's officials would normally have sought a new helicopter but the budget didn't allow for the higher expense. "A helicopter can cost... a lot of money, particularly in these tough economic times," explained Captain Williams. Instead, the department will buy the CTLS and most of the airplane's cost will be covered by Homeland Security. After interviewing the sheriff Castellon wrote, "While the plane may not do everything a helicopter can do, the Flight Design CTLS that sheriff's officials plan to buy can do much of what the department's existing plane - a twin-engine 1973 Cessna Skymaster - can do with lower fuel and maintenance costs." It also will be able to do some tasks a helicopter can do, Williams added. Since the LSA can slow to 50 mph, it can circle and conduct aerial searches for suspects on the ground. "You can make the same sort of orbit as a helicopter without any problem at all," Castellon quoted Williams as saying. Williams is one of two deputies who fly the Cessna and will fly the CTLS once it is delivered, probably in May or June. Flight Design has agreed to install a video and forward-looking infrared camera and spotlight on the CTLS. The Tulare County Sheriff's department also plans to upgrade their CTLS to an all-digital panel including a built-in screen to observe what the cameras see, Williams said. Funding for the well-equipped aircraft comes from a Homeland Security grant with the balance coming from money seized during narcotics investigations. Castellon reported that once the Sheriff's Department has its new plane, officials have a new duty in mind for it - to fly air patrols across the county five days a week, as well as respond to emergencies. Air patrols aren't cost-effective tasks for the twin-engine Cessna the department currently operates. "It burns about 30 gallons of fuel an hour," Williams said. "The new airplane burns three or four gallons of fuel an hour and it uses regular auto fuel rather than aviation fuel." "We are pleased to add the sheriff's department to a fire department in Ecuador as the proof that CTLS can serve functional purposes," observed John Gilmore, national sales manager for Flight Design USA. Government agencies are generally not restricted regarding their productive use of LSA. Flight Design is a 24-year-old air-sport products producer based in Germany. 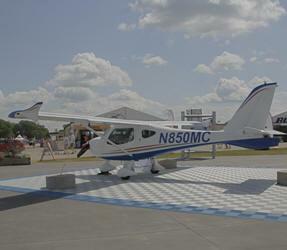 The company remains the worldwide market leader thanks to its well-received CT series of light aircraft. More than 1,700 of these aircraft are flying in 39 countries. One of the first aircraft certified under ASTM International standards in 2005, the CT ("composite technology") series remains the top-selling LSA in America through six consecutive years. Flight Design sold the first LSA to India and was the first LSA to earn Chinese Type Design Approval. A newer model, the four-seat C4 will debut in 2011.